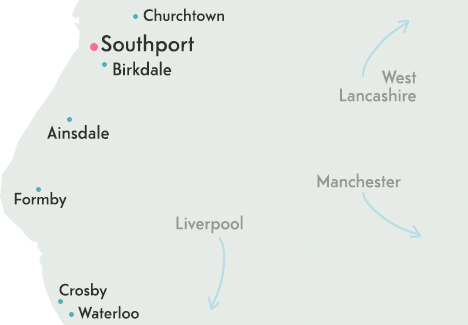 Situated on the Sefton coast, Southport is easy to reach from all over the North West. Close to both Liverpool and Manchester, Southport is a great coastal town to escape the hustle and bustle of a big city for a day out, short break or a 'staycation'! Boasting a beautiful and expansive coastline, Southport is surrounded by natural beauty, making it a great place to escape. Starting your journey along the coast, at Crosby beach you can experience the Anthony Gormley 'Another Place' art installation, 100 iron men standing proudly looking out to sea, which at various points throughout the day can be seen in very different ways, giving you a different expeirence every time. Heading to Formby beach, you climb through the natural dunes until you come to the most beautful and expansive view of the coast before your eyes. Moving towards Southport, Ainsdale beach is a haven of things to do where you can kite surf, para cart and enjoy other beach attractions and activities - perfect for active families. Once in Southport you can leave the town behind and head to Southport beach, build sandcastles or wander down the pier and enjoy the beautiful coastal views, we are sure you won't be disappointed! Watch the birdies fly on our world-class golf courses or feel the need for speed at the Southport Air Show. Watch music and sparks make magic in the sky at the British Musical Fireworks Championship. Time to fill your tummies, it's time for the Food and Drink Festival. All year round, Southport is host to many events, making your visits different every time! Boasting the most independent eateries and restaurants outside of London, Southport is rich with its food offering. Breakfast, lunch, dinner, coffee stop or food on the go - there is always time to sample some high quality cuisine in Southport. Once the night time arrives it is time to explore the bars and pubs in Southport. Gin bars, whiskey bars, speakeasy bars, this is your time and whatever you fancy, you can enjoy it in Southport! Whether it is building sandcastles on the beach with the kids, or eating fish and chips on the promenade watching the sun go down. Enjoying the tranquillity of the coast wandering along the Pier or having some fun in the arcades. Trying the exciting water sports or the thrills of a funfair. Exploring nature reserves and enjoying some of the best walking and cycling routes. Magnificent fairways, tree lined boulevards, miles of coast and attractive woodland. Boutique hotels, luxurious B&B’s, warm and cosy 'home from home' guest houses. Southport is brimming over with places to stay the night, weekend or longer. Pick and choose to suit your needs. Planning a splash-tastic time at Southport's Splash World?...If so, you have come to the right place!...Click here to get the latest Splash World information and recommendations! Join the boy who never grows up… This well loved children's classic is magical , whimsical fun for all the family, let your imagination be captured this Easter at Southport Theatre at the Waterfront. Not ony does Southport have 22 miles of coast it also boasts a Grade II listed pier on Southport Beach. The centre which opened in 2009 is one of the UK's premier full accessible venues for water sports and provides a range of learning and recreational facilities. The Marine Brasserie, Lounge & Bar is renowned for being one of the finest places to eat in Southport. This Southport attraction is ideal for kids who love trains, many spend all day watching their favourite locomotive as it meanders around the 1.5 acres of beautiful miniature landscape. Pleasureland is Southport's premier attraction for families looking for a wonderful place to go. It offers families a mix of thrilling roller coasters, flumes and waltzers plus loads of rides designed for younger visitors.